Gunfire erupted Friday afternoon at a business where the suspects in the terror attack on a Paris newspaper's office were holed up northeast of the French capital, and officials confirmed to CBS News that the two men had been killed and and their hostage has been freed. Just minutes later, another hostage-taker in Paris was killed in a separate standoff, along with three of his hostages. There was gunfire and heavy police activity around the town of Dammartin-en-Goële, about 30 miles northeast of Paris, Thursday as police cornered the suspects in the Charlie Hebdo shooting, French-Algerian brothers Said and Cherif Kouachi. 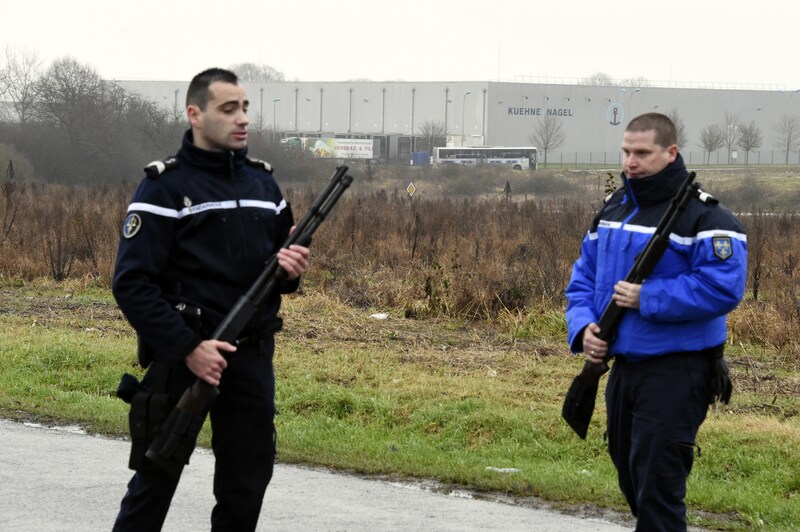 They had taken one man hostage inside a printing business on an industrial estate in Dammartin, less than 10 miles away from Paris' Charles de Gaulle Airport. After hours of relative calm at the site, during which time police widened their security cordon around the industrial complex, automatic gunfire and at least a couple small explosions were heard. An official with the French Gendarmerie confirmed to CBS News that both of the Kouachi brothers were killed in the raid and the one hostage rescued safely. The gunfire lasted about 3 minutes and a small amount of smoke was seen coming from the top of the building afterward. A helicopter landed inside the security cordon after the shots. One member of the French security forces was slightly injured in the raid. The printing business where the suspects were trapped has a small staff of only about five employees, including the owner and at least two relatives. In an address Friday night, French President Francois Hollande said "this is a tragedy for the nation and an obligation for us to deal with it." "I want to salute the courage, bravery, efficiency gendarmes, police officers, all those who have participated in these operations," he said. "I am proud of them." France's Interior Minister Bernard Cazeneuve said earlier that an "ongoing operation" to apprehend the suspects was underway in Dammartin. Elite French troops and anti-terror police quickly swarmed into the area, and police were not allowing members of the media to enter the village. French officials told the Associated Press that police had established phone contact with the Kouachi brothers, but there was never confirmation that negotiations were underway. One report said the men had refused to talk to police. A U.S. counterterrorism source told CBS News on Friday that officials did not expect the Kouachi brothers to give up. The feeling was that they had been avoiding capture and hoping to go down in a blaze of glory or escape to fight another day. A French lawmaker told the AP earlier in the day that the men had told police they wanted to die as "martyrs." Intelligence analysts in the United States are scrubbing files and old intelligence information to search for any connection between the Paris terrorist suspects and anyone in the U.S., CBS News has learned. Late Wednesday CBS News correspondent Bob Orr reported that that the two brothers at the heart of the manhunt had been on the U.S. no-fly list. FBI officials around the country have also been tasked with running to ground any information being gleaned from Paris. So far there is no indication of any plot involving the United States. Police were methodically evacuating civilians from Dammartin, and schools in neighboring villages were also sending students home. Meanwhile, another gunman, Amedy Coulibaly, multiple hostages Friday afternoon at a kosher grocery in the Porte de Vincennes neighborhood of Paris also died in a nearly simultaneous raid there, officials said. Four people in the store were killed during the standoff. Coulibaly, born in 1982, was suspected of fatally shooting a police officer on Thursday morning just south of the capital in Montrouge. Police were also looking for his girlfriend, Hayat Boumeddiene, in connection with the Thursday shooting. Four loud explosions at the scene in Porte de Vincennes -- just minutes after the eruption of gunfire in Dammartin -- signaled the beginning of the rescue raid. Coulibaly was believed to have been a close acquaintance of the Kouachi brothers, and possibly a member of the same group rounded up in 2008 for recruiting jihadists to travel to Iraq. A man who claimed to have spoken to the suspects in Dammartin on Friday morning told a French news outlet they appeared calm and told him to "go home," adding that they did not intend to kill civilians. The man's account could not be independently verified. The Kouachis, in their early 30s and both with documented histories of jihadist activity, have been on the run since they allegedly killed 12 people in a massacre at the headquarters of the satirical newspaper Charlie Hebdo on Wednesday. They were raised in France. Cherif Kouachi's arrest in 2008 for recruiting fighters in France to travel to Iraq made him the more well-known of the two, but his older brother Said may actually have had stronger ties to al Qaeda terrorists, CBS News' Bob Orr reported Thursday. U.S. sources said French investigators have evidence Said traveled to Yemen in 2011 and linked up with al Qaeda in the Arabian Peninsula, or AQAP, the terror network's affiliate based in the country. CBS News has been told Said "spent several months" in Yemen training with AQAP. On Friday, a member of al Qaeda's branch in Yemen said the group directed the attack on Charlie Hebdo "as revenge for the honor" of Islam's Prophet Muhammad. The member on Friday provided to CBS News a statement in English saying "the leadership of AQAP directed the operations and they have chosen their target carefully." During Said's time in Yemen, AQAP's terror operations were being run by the U.S.-born radical cleric Anwar al-Awlaki. A man purporting to be Cherif Kouachi called a French TV station Friday, claiming that he was financed by radical American-Yemeni cleric Anwar al-Awlaki. U.S. officials considered al-Awlaki, who was killed in a U.S. drone strike in September 2011, to be an inspirational leader of al Qaeda. The man claiming to be Cherif Kouachi made the comments to BFM-TV, according to a recording aired by TV channel after the Kouachi brothers were killed by French security forces. Awlaki was the inspiration behind Nidal Hassan's massacre at Fort Hood. Awlaki also led the failed attempts to hit the U.S. with bombs smuggled onto jetliners inside underwear and computer printers. It's not clear if Said had any direct dealings with Awlaki before returning to France in 2011. Awlaki was killed by a U.S. drone strike on September 30th the same year.